Yesterday I was hanging out with my bff, the Internet, and accidentally read a spoiler about the rest of the season. I was weak...and my anger towards Tierra was making me rage. I HAD TO KNOW WHEN/IF SHE WAS LEAVING. I was tired of hulking out though you guys. WHAT IF I KICKED MY TV LIKE LISA TURTLE WHEN HER FAVORITE NAIL POLISH WAS DISCONTINUED? .I don't do well on crutches. I won't reveal what I read because I don't know if it's true. However, just knowing what supposedly happens (good/bad/ugly/dented forehead) helps me watch without such blinding rage. The first date went to Catherine. She stood in a snow storm waiting for Sean who drove up in a zamboni of sorts. They made snow angels and did flips and had a blast. So now we know what he'll look like when he's 80, retires to Florida, and gets a wicked sunburn. After they spent the date outside they traveled to yet another outdoor location for dinner. And sitting inside of one. Catherine told a story about why she lives life to the fullest. One day at summer camp she was walking in the woods. Her friend walked in front of her and a tree fell on her and she died. The classic friend killed by a tree now I YOLO tale. 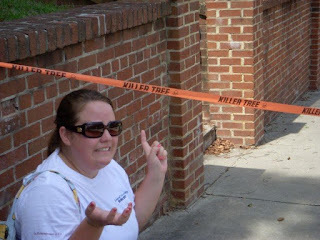 I mean killer trees are a real thing. I just didn't know they were so prominent in society. They seem to have fun and she seems low maintenance which is saying something. Selma, Ke$ha, Sarah, Tierra, Lesley, and AshLee. This is going to shock everyone but...Sean is outdoorsy and he likes to be outdoors...because he's outdoorsy. So the group date was: outdoors. The plot twists on this show are intense. Of course Sean had another surprise in store. Everyone was going to participate in the POLAR PLUNGE! Well not everyone...people could choose. Women were acting like they were choosing new identities not whether or not they should jump in cold water. Selma was the only one to stay back, because she's from Baghdad...and they don't do cold. Everyone hopped in and hopped right back out. Sean & all women except Tierra: THIS IS GREAT! THAT WAS SO FUN! LET'S GO TO DISNEY WORLD! IS THAT A UNICORN? I THINK IT IS? Tierra's reaction: I'M DYING. SEAN HELP ME I'M COLD. I'M PREGNANT. IT'S YOURS. Tierra "couldn't breathe" and was "unresponsive." Tierra also couldn't buy waterproof mascara. "I missed out on time with himmmmmmuh." Yeah. That's definitely what you should be thinking when you're about to head towards the light and meet Patrick Swayze in the sky. They piled a bunch of towels on her and fed her some pizza. Meanwhile everyone hopes thinks she's dead. Later on, Sean comes to check on her and to the viewing audience's surprise...her hair and make up is done even while hooked up to an oxygen tank. I'm going to be real honest with everyone. I think she faked it. Oh wait, everyone thought that? Only Sean fell for it? Sean ended up telling her to take it easy and not show up for the after party. Clearly she didn't listen and showed up. and was impressed with how warm her hands were. She said she still felt cold on the inside. I have a feeling that wasn't from the polar plunge so much as it was because SHE DOESN'T HAVE A SOUL. The best part of this date was when Sean gave out the rose. Tierra was convinced it was hers because she came to the date even after almost dying. Jokes on her because that rose went to Lesley. He later went back to the hotel because he felt there was something that he needed to do. There was a woman he didn't feel a connection with anymore and he needed to let her know. He let Sarah go home, and the way she took the news and her explanation at the end was super sad. She's been friend zoned her entire life and she's afraid it was only going to continue. I felt really bad for her. She didn't even make a one arm comment once. I think I'm going to miss her. The last 1 on 1 date was with Des. They repelled down a mountain. They ate lunch in a field. The night portion of the date was probably the best thing that has ever happened during the entire time I've watched this show. "Did you eat your fish? Good..."
The actual best line ever came from Des. They were in a TEEPEE talking about their lives. Sean was telling her how humble she was and she agreed...as most humble people do. She revealed that growing up she lived in a tent. So material things don't matter to her. "I grew up in a tent and now I'm FALLING IN LOVE IN A TEEPEE." Where do the producers find these people? What questions do they ask to get these answers? She couldn't go to a birthday party at Chuckie Cheese because she got sick. Why he didn't respond to us is a mystery. During the rose ceremony Selma decided she needed to step up her game since she didn't jump in the lake during the date. So gave the audience the disclaimer that she was about to shame her family. Then she told Sean to hold still and kissed him on national television. AshLee did this weird trust exercise where she asked Sean to blindfold her and lead her somewhere. She said she was really scared because she hates getting blindfolded. You know who hates getting blindfolded? Personally, I love getting blindfolded because it usually means there's a pinata present. AshLee needs to lighten up. He ended up sending home Ke$ha, who was shocked. The last rose went to Tierra leaving Selma flowerless. Remember that time she shamed her family? It looks like next week Tierra throws another fit getting her a ton of positive attention from Sean. I'm hoping something else exciting happens because I'm over this nonsense. I also miss Chris Harrison. Where has he been these last two episodes? Come back to be Chris. Hi! I jumped over from Camp Patton and have been reading your blog posts obsessively for a while...they are so great! I especially like the 80 year old Sean comment. First of all, have you noticed Tierrable always says "pity" instead of "petty"? It's so pity how fusstrated she gets on this show. Second of all, I think my fave so far is Catherine because she seems like she meshed well with Sean on the 1 on 1. Des is a close second, though. Third, I want to know when Ms. Tierrable is kicked out so badly but don't want to see other Spoilers when looking! Spoilers are the only rage extinguisher for this show. I'm really impressed you held out as long as you did! I'm all over the spoilers months before the show even airs. That Bill Cosby bit was gold. PURE gold. While I was watching this today (I was behind) I paused it as soon as the teepee sweater was donned and pulled up Twitter just to make sure that you'd mentioned it. You don't disappoint, my friend. Don't worry there is more exciting stuff coming... remember in previews that someone's "boyfriend" shows up? I love your recaps, thanks for posting and tweeting! You are stronger than me, Ashley. I broke down last week and had to find out what happens to the Tierrarist. Other than your blog, I haven't seen any pregnancy spoilers yet, but we are only halfway done with the season - she still has time to call TMZ with one. P.S. You are real good at this. I think you should be a writer for this show. Your so funny! You don't know me but I love you. oh, anonymous. you always know exactly what to say. okay ... I didn't read any spoilers but I found Sean's sister's blog and she hates tierra .. it warms my heart. also ... I started following one-arm on the gram and um ... she was in a superbowl commercial with TWO ARMS???? no, my three kids don't keep me busy enough, clearly. anyway --- you know I heart the recaps. I don't know what Im going to do with only ONE recap this week .. luckily next week there are two episodes again ...... i think. let me google. I always think the same thing!!!!!! Like where is Lindsay's wedding dress? "I LOVE LAMP!" You're the bestest and I HEART YOU. Totally agree on the teepee comment. you're the funniest blogger i know. love the recap. Cydia constantly. BlackBerry is down to 22 % of the market.